Viktor Yushchenko was Prime Minister of Ukraine from December 1999 to April 2001. After being voted out of office 263 votes to 69 votes, Yushchenko became leader of Our Ukraine, a political coalition (a combination of people working for the same cause). Members of Our Ukraine won 101 seats in the 450-seat legislature in 2002, making Our Ukraine the most powerful party in Parliament (Ukraine's governing body). In 2004 Yushchenko was elected the president of Ukraine in the country's first free election. During his campaign, he was poisoned with a near-fatal dose of the toxin dioxin. The poisoning has left him with permanent scars on his face. This personal attack left Yushchenko even more determined to lead his country out of the state of government and police corruption it has been living in for decades. Yushchenko graduated college in 1975 from the Ternopil Finance andEconomics Institute. His first job was with the Union of Soviet Socialist Republics (USSR) State Bank, where he was an economist and department chief. After earning his graduate degree in finance and credit from the Ukrainian Institute of Economics and Agricultural Management in 1984, Yushchenko was appointed Deputy Director for Agricultural Crediting for the Ukraine branch of the USSR State Bank. He held this position until 1987, when he left for another banking position elsewhere. The National Bank of Ukraine (NBU) hired Yushchenko to be its governor (president) in 1993. NBU was Europe's newest central bank at the time, and Yushchenko played an important role in developing its policies and procedures. He stayed with NBU for six years. 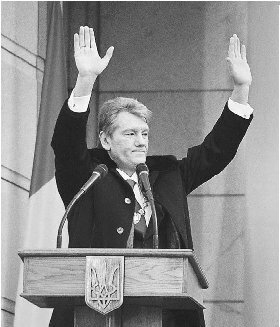 In December 1999 Ukraine's president, Leonid Kuchma, nominated Yushchenko as prime minister. In this case, a prime minister is the person responsible for carrying out the president's orders and directives. It is an important job. Parliament approved Yushchenko's nomination 296 to 12. "I am not afraid of anything or anybody." with paying off millions of dollars of Ukrainian debt through cuts in federal spending and by improving investment conditions in the country and overseas. Because of his success, Yushchenko was able to restore public trust in government, something that was destroyed through years of political corruption. One of the more challenging aspects of Yushchenko's job was to increase the level of honesty and open communication between the government and the public. Prior to his election, Ukraine lived in fear of its government leaders, who were infamous for their willingness to stop at nothing to get what they wanted. In 2001, Yushchenko's deputy prime minister, Yulia Tymoshenko (1960–), got into a heated argument with leaders of the coal-mining andnatural gas industries. These leaders were powerful and had great influence on an already-corrupt government. As a result, parliament voted to remove Yushchenko from office, 263 to 69. Though a harsh response, this move did not come as a great surprise to anyone. The government in Ukraine was mainly Communist; it believed in a powerful governing body that gave citizens few choices in anything ranging from food to healthcare. This is called a centralized government. Yushchenko believed in democracy and capitalism: He wanted people to be able to own businesses and enjoy the freedoms that America is known for. His beliefs threatened those few powerful men in Ukraine's government. Four million votes were gathered in support of a petition to get Yushchenko back in office. Tens of thousands of Ukrainians protested his dismissal. Their efforts were of no use; Yushchenko was out of office. But he was not out of power. Early in 2002 Viktor Yushchenko became the leader of Our Ukraine, a political coalition. Our Ukraine united various democratic parties and groups from across the nation in hopes of bringing democracy to the Ukraine. Our Ukraine formed the largest parliamentary faction of 2002, claiming 101 seats of the 450-seat legislature. It seemed the corrupt government of Ukraine was in danger of being overthrown. Although Ukraine's presidents were determined by election, it was no secret that fraud was widespread in elections. Everyone knew it, and no one felt able to fight it with even a remote hope of winning. Yushchenko changed that. When he announced he would run for the office of president in the 2004 election, Yushchenko brought hope to hundreds of thousands of citizens who were weary of living under a dictatorship disguised as a presidency. They were ready for a change. Yushchenko was running against Prime Minister Viktor Yanukovych. Yanukovych was a political ally of outgoing president Leonid Kuchma. Kuchma's administration depended upon corruption and dishonesty for its power. Government officials ruled with a sense of terror rather than justice. For the powerful and wealthy few, having Yanukovych elected president was important. Should Yushchenko win, Ukraine's government was sure to topple. Yushchenko's campaign promises included a better quality of life for Ukrainians through democracy. His wife, Katherine, told CBS in a 2005 interview, "He was a great threat to the old system, where there was a great deal of corruption, where people were making millions, if not billions." On September 6, 2004, Yushchenko became ill after dining with leaders of the Ukrainian secret police. Unlike other social or political engagements, this dinner did not include anyone else on Yushchenko's team. No precautions were taken regarding the food. Within hours after the dinner, Yushchenko began vomiting violently. His face became paralyzed; he could not speak or read. He developed a severe stomachache and backache as well as gastrointestinal pain. 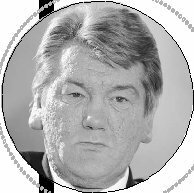 Outwardly, Yushchenko developed what is known as chloracne, a serious skin condition that leaves the face scarred and disfigured. 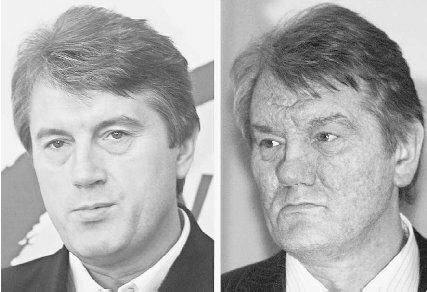 Viktor Yushchenko photographed in March 2002, left, and December 2004, right. Toxicological analysis found the mysterious illness that scarred his face was caused by dioxin poisoning. controversial war in which the United States aidedSouth Vietnam in its fight against a takeover by Communist North Vietnam). Yushchenko had a dioxin level six thousand times greater than that normally found in the bloodstream. His is the second-highest level ever recorded. Yushchenko immediately suspected he had been poisoned, though Kuchma's camp passionately denied such allegations. Instead, when Yushchenko showed up at a parliamentary meeting shortly after the poisoning incident, Kuchma's men teased him, saying he must have had too much to drink or was out too late the night before. Dioxin can stay in the body for up to thirty-five years. Experts predict that his swelling and scars will fade but never completely disappear. John Henry, a toxicologist at London's Imperial Hospital, told RedNova.com, "It'll be a couple of years, and he will always be a bit pockmarked. After damage as heavy as that, I think he will not return to his film star looks." And Yushchenko will live with the constant threat of cancer. At first it was believed the poison must have come from a Russian laboratory. Russia was a strong supporter of Kuchma and lobbied against Yushchenko in the 2004 election. But by July 2005, Yushchenko's security forces were able to trace the poison to a lab in Ukraine. Though not entirely ruling out Russia's involvement, Yushchenko is quoted on his Web site as saying "I'm sure that even though some people are running from the investigation, we will get them. I am not afraid of anything or anybody." Even an attempt on his life didn't stop Yushchenko from finishing his presidential campaign. On October 31, 2004, neither Yushchenko nor Yanukovych won the absolute majority of votes (meaning no candidate received more than 50 percent of the votes). Ukrainian law mandates that in such an event, the two candidates with the highest number of votes must compete in a run-off election. The winner of that election would officially become president. That election took place on November 21, 2004, in Kiev, the Ukraine capital. Exit polls (the unofficial tally of votes at the end of an election) on November 21 showed that Yushchenko had an 11 percent lead over Yanukovych. Official results gave the election to Yanukovych by a mere 3 percent. Official votes were counted by officials under the authority of Yanukovych. The incumbent laid the blame for the difference on the media's shoulders. But Yushchenko's team countered by publicizing obvious evidence of electoral fraud on the part of the government, which backed Yanukovych. Signs of similar fraud were apparent in the original election held in October, too, but to a much lesser—and more difficult to prove—extent. The Ukrainian people had had enough. Hundreds of thousands of protesters gathered in Kiev and other cities across Ukraine. Yushchenko supporters planned strikes and sit-ins to protest the obvious rigging of the run-off election. They wore orange ribbons, carried orange banners, and wore orange clothing. Orange had been the official color of Yushchenko's campaign. Thus, the Orange Revolution was born. The Orange Revolution brought Ukraine's political crisis to the attention of the entire world. Ukraine's Supreme Court demanded another run-off election be held. Voters gathered together once again, andthis time, the results were clear. Viktor Yushchenko was declared the official winner and was sworn into office on January 23, 2005, in Kiev. He became the country's first freely elected president. After the final election, the New York Times reported that Ukrainian security agencies helped the Orange Revolution succeed. Remember, these agencies were under the authority of the corrupt president and his favored candidate, Yanukovych. The paper reported that on November 28, more than ten thousand troops were ordered to put down the Orange Revolution protests in Kiev. The commander of the military unit warned Yushchenko's team of the crackdown, thereby giving them time to alert the protesters and avoid bloodshed. Further revelations show that many intelligence officers supported Yushchenko's ideas of democracy andgatheredproof of voting fraud and incriminating conversations held between leaders of Yanukovych's team. It is believed that this evidence was recorded and provided to Yushchenko by Ukrainian Security Services. After his official election with a 51.99 percent of the vote, Yushchenko addressed the crowd: "This is a victory of the Ukrainian people, the Ukrainian nation.... This is what dozens of millions of Ukrainians dreamt about. Today it is fashionable, stylish and beautiful to be a citizen of Ukraine." And at 3:00 AM on December 27, he addressed his supporters with "during 14 years we were independent, but we were not free," as reported in the Ukrainian Weekly. Viktor Yushchenko waves to supporters during a ceremony to mark his inauguration in Kiev, Ukraine, January 23, 2005.
joined together in an effort to establish rules and regulations of trade, labor, and business that would make for a more stable economy. In the past, Ukraine was indifferent to the EU; it wanted no part in the framework. Instead, president Kuchma favored privatization of the Ukrainian economy, which meant giving all the power to a handful of people who had pledged their support to Kuchma. Yushchenko recognized the benefits that belonging to the EU would provide his country. In an article on his official Web site, Yushchenko said, "The citizens of no European country object to Ukraine joining the EU. We consider that Ukraine is an inseparable part of Europe." Although Russian president Vladimir Putin (1952–) gave his support to the opposition, Yushchenko held a series of high-profile meetings with the leader in 2005. Political experts expected progress in all areas that once were deadlocked under the old leadership. Already by July 2005, Russia was exporting more goods to Ukraine than ever before. The key to improving relations with Europe and joining with full membership in the EU is Ukraine's relationship with Russia. Russia is a political and economic powerhouse, and Yushchenko was not the president Putin was hoping to deal with. Six months after Yushchenko's victory, supporters of Yanukovych lined the streets in protest. Some were so angry that they quit their jobs and lived on the streets full time. These protesters claimed that anyone who supported the opposition was being persecuted. Yanukovych has been questioned by the police many times, and the Ukrainian Ombudsman (person who works with people who have a complaint) said it was investigating the cases of twelve thousand workers who said they were fired because they did not support Yushchenko in the election. The Minister of Justice denied that anyone was being politically persecuted. He told BBC News that authorities were investigating allegations of corruption because to do otherwise would be a violation of the spirit of the Orange Revolution. "People were demanding justice." There is no doubt Yushchenko was making drastic and sweeping changes. July 18, 2005, was a particularly busy day for the president. He dismissed the leaders of all regional interior departments. The president told leaders at a meeting of Interior Ministry officials, "Trust in police must be restored. This is our common work, which must begin from replacing the local police heads." That same day, Yushchenko ordered a decree to be drawn up that would disband Ukraine's traffic police department. After deciding it was impossible to rid the department of deep-seated corruption, the president announced he would abolish the department altogether, leaving twenty-three thousand employees out of work. Traffic police in Ukraine are known for their habit of stopping motorists and fining them on the spot for imaginary offenses. They are infamous for demanding bribe money. Yushchenko claimed that he warned senior officials three times that if the department did not clean itself up, he would get rid of it. The new patrol service would be closely monitored for bribe-taking and swearing. Yushchenko told law enforcement officials, "You are servants of the state. Try to talk without swearing. If anyone can't learn to do this, then write a letter of resignation." In July 2005, Yushchenko's nineteen-year-old son, Andriy, became embroiled in a scandal that infuriated Ukrainians, regardless of their political convictions. Journalists brought to light Andriy's lavish lifestyle and questioned the morality of such a lifestyle in a country that is still struggling to find its way. According to Mosnews.com, the young Yushchenko drives a brand new BMW 16 (valuedat $120,000), uses a platinum body Vertu mobile phone (priced at $30,000), and bribes restaurants with wads of cash to give him the best tables. These facts alone are not unusual when talking about the children of political leaders; many children of leaders worldwide live lives of luxury. But in this case, the problem stems from where the money comes. Nikolai Katerinchuk, Ukraine's deputy head of the country's tax inspectorate, claims Andriy's annual income amounts to $100 million. And that money comes from the sale of Orange Revolution memorabilia. After Yushchenko's election victory, the president gave his son all property rights for Orange Revolution memorabilia. The items are still popular and enjoy steady sales in the region of Kiev. A flag sells for $1-$5; a T-shirt costs $20. According to a 2005 Russian News and Information Agency article written by political commentator Peter Lavelle, when asked about his son's spending habits, the president replied, "Let me tell you, friends, such ... [questions] should be humiliating for an honest journalist." Yushchenko has been highly criticized for his emotional response to his son's predicament. Many citizens see his reaction as symbolic of all that is wrong since the Orange Revolution. Lavelle considered Yushchenko's comments to be the same as an admission of how little has been done to deal with corrupt government officials since Yushchenko took office. Ukrainian citizens are very aware that some state officials continue to live well at the expense of every one else. This is seen as a breach of just one of the promises made by the Orange Revolution. To make matters worse for Yushchenko, frustration levels of the public were already high due to the lack of justice for murdered journalist Georgy Gongadze. Thirty-one-year-old Gongadze was the respected publisher of the online journal Ukrainska Pravda, a publication known for its willingness to print the truth even if it angered people in powerful positions. He was considered a hero for the underdog, a champion of justice in the midst of evil. The journalist went missing on November 13, 2000. He was found beheaded in a ditch some time later in a suburb of Kiev. At the time of his death, Gongadze had been investigating government corruption in Ukraine. Since Gongadze's murder, two more journalists have been killed. Although an investigation got underway, no satisfactory results have been publicized. Yushchenko had promised citizens that the case would reach the courts by May 2005. As of August that year, his pledge went unfulfilled. Yushchenko has been criticized for hiring incompetent lawyers, and it is considered fact that Kuchma had been buying off people in the case whose knowledge might help solve the crime. It is widely suspected that Kuchma ordered the journalist's kidnapping and murder, but no progress seemed to have been made in proving that allegation. Yushchenko was being held accountable for that lack of progress and justice in the Gongadze murder. Failure to close the case was damaging the president's legitimacy, as well as those who serve under him. The hopes that fueled the Orange Revolution have been seriously dimmed. Fawkes, Helen. "Protest camps badger Yushchenko." BBC News (July 18, 2005). http://news.bbc.co.uk/go/pr/fr/-/2/hi/europe/4693419.stm (accessedon August 9, 2005). Lavelle, Peter. "Yushchenko loses his Orange Revolution cool." Russian News and Information Agency Novosti (July 27, 2005). http://en.rian.ru/analysis/20050727/40985857.html (accessed on August 9, 2005). Mite, Valentinas. "Ukraine: Has Yushchenko's Political Honeymoon Come to an End?" Radio Free Europe/Radio Liberty (July 27, 2005). http://www.rferl.org/featuresarticle/2005/07/6ed958c8-e9ab-4781-9aeb-3664aea0b123.html (accessedon August 9, 2005). Nynka, Andrew. "Yushchenko elected president of Ukraine." Ukrainian Weekly (January 2, 2005). http://www.ukrweekly.com/Archive/2005/010501.shtml (accessedon August 9, 2005). Presidentof Ukraine: Official Web Site. http://www.president.gov.ua/en/ (accessedon August 9, 2005). "Profile: Viktor Yushchenko." BBC News (January 1, 2005). http://news.bbc.co.uk/go/pr/fr/-/2/hi/europe/4035789.stm (accessed on August 9, 2005). "Ukraine disappoints the West." Pravda.ru (July 28, 2005). http://english.pravda.ru/world/20/92/370/15875_Ukraine.html (accessed on August 9, 2005). "Ukraine traffic police abolished." BBC News (July 18, 2005). http://news.bbc.co.uk/2/hi/europe/4694199.stm (accessed on August 9, 2005). "Viktor Yushchenko." Biography.ms. http://victor-yushchenko.biography.ms/ (accessedon August 9, 2005). "Yushchenko: 'Live and Carry On'." CBSNews.com (January 30, 2005). http://www.cbsnews.com/stories/2005/01/28/60minutes/main670103.shtml (accessedon August 9, 2005). "Yushchenko poisoned by most harmful dioxin." MSNBC.com (December 17, 2004). http://www.msnbc.msn.com/id/6697752/ (accessedon August 9, 2005). "Yushchenko Poisoned, Doctors Say." DW-World.DE Deutsche welle (December 11, 2004). http://www.dw-world.de/dw/article/0,1564,1425561,00.html (accessedon August 9, 2005). Yushchenko, Viktor. "Our Ukraine." Opinion Journal (December 3, 2004). http://www.opinionjournal.com/editorial/feature.html?id =110005974 (accessedAugust 9, 2005).